A microwave is one of the most unpredictable stuff right in your kitchen. It does not focus on the job you expect it to do rather it does exactly the opposite. Who even like to give a few rounds of using the microwave just to get a perfectly warm cooked meal. For this, Panasonic has thought to give their models a great technology so that you don’t have to face the hassle anymore. So, here is one of their models known as NN-SD372S which is not only popular for its performance but also for more features that it serves. For this, here I have this Panasonic NN-SD372S review for you to underline. So, if you want to find out if the Panasonic NN-SD372S has what it takes to be your next purchase, then stay with us and continue reading our Panasonic NN-SD372S review! 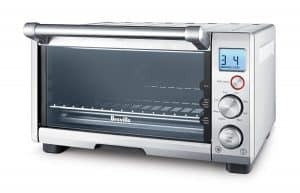 Also, if you want, make sure that you check out our ultimate convection oven reviews. Here are some features that you would definitely want to know about the oven. So why not we start the Panasonic NN-SD372S Review with its features. 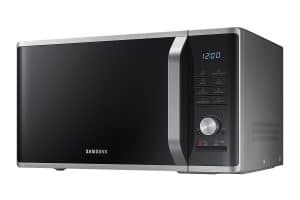 One of the most notorious things about microwave is that it rather tends to cook the exterior of the food quicker than the interior of your food. And as for the chocolate, the opposite result is sheer disappointing as well. It’s because when you make an attempt to melt chocolate inside the microwave, it is likely to burn the inside of the chocolate bar while the outside maintains its full form. And like obvious, both the issues are not only annoying but troublemaking for baking and cooking processes. Well, this microwave does not seem to be that much annoying. It has a terrific Inverter Technology that takes care of every issue elegantly. So, no more worrying about circling frozen pasta 3 to 4 times just to make sure that the outer side does not wrinkle up while the inner side stays frozen. Albeit knowing about the technology in detail will be really troublesome as I personally did not get a clear idea how does it work. But however, you can assure yourself that with this technology, the machine heats the food evenly and perfectly. One of the reasons to come with this NN-SD372S review is its 950 watts of sheer power. While 1000 watts is almost the top of microwave wattage range, this machine is here to deliver 950 watts for cooking your meal faster than ever. Hence, having a meal has become a matter of some time for this microwave. So you can say that all these oven aims are to cook the food as quickly as possible. With this machine, you can prepare a whole meal just in a fraction of the time. So, why not you start putting a big bag of popcorn, you will witness them be fully popped in just 2 minutes. The NN-SD372S has the ability to take the guesswork out of cooking via adjusting the levels of power automatically and estimating cooking times for a variety of food, be it for frozen nibbles, or for vegetables or beverages. The machine is able to cook different types of food automatically. There is also an automatic defrost function that you can use. Talking more about the auto features, it also has an auto reheat function that sets the timer and temperature for the time it would take to heat the food exactly without re-cooking and thus does the job of reheating precooked foods like a pro. Well, if you have kids at home, there will be times that they would try to play with this machine. it will certainly cause harmful jeopardy. So for this, Panasonic has invested a child-lock feature that prevents the electronic operation to work. All you have to do is, poke the Start button 3 times and voila! The machine will get locked. For unlock, you have to hit the Stop or Reset button 3 times again to use the microwave back again .Hence, These are some things that definitely are needed to be highlighted in this NN-SD372S Review. Also Read: Panasonic NN-SD681S Review. The Keep Warm options run for about 30 minutes. You can cook a variety of food with this microwave. It provides 950 watts of power to heat the food quickly. The microwave cooks the food with pure silence. Being compact in size, it is able to be placed on your countertop and can house a regular sized dinner plate easily. The microwave is enough lightweight. It has 10 power levels with 3 cooking stages. The buttons are poke friendly. The light stays on when it is left open. It is not entirely stainless steel exterior. The dial function is a bit tricky. Time display is a bit difficult to read at an angle. There is no convection function in this machine. What is the quick minute feature? Can you explain it in detail? Answer: After you hit the Quick Minute button, the timer will be set to 1 minute. When you hit it twice, it will be set to 2 minutes and so forth. It just eliminates the steps of turning the knob of the dial for selecting addition of 1 minute. Then, press the Start to activate the microwave. However, if you want to warm food for about 1 minute and 30 seconds, you cannot use the Quick Minute button as you have to add 30 seconds via turning the knob. Does the microwave have an interior light? Answer: Yes, it has an interior light. There is an LED panel on the right side that lights up the interior really well. The light turns on whenever you open the door and whenever the microwave is being operated. Answer: The power cord of this oven is about 39 inches long. 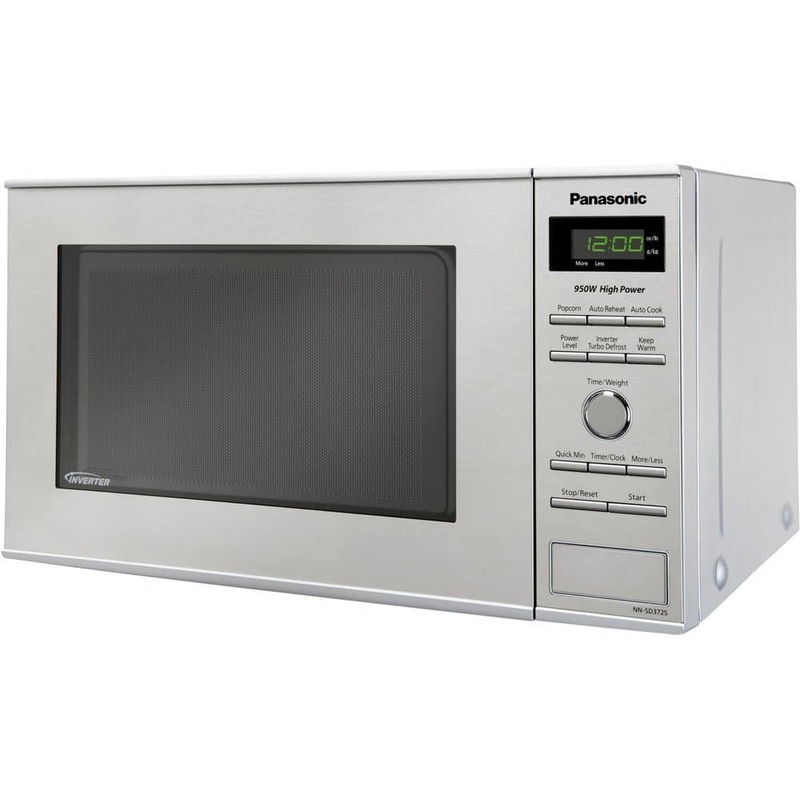 Answer: The interior dimensions of the microwave are 7.5 inches high and 12.5 inches wide, and it’s 13 inches deep. 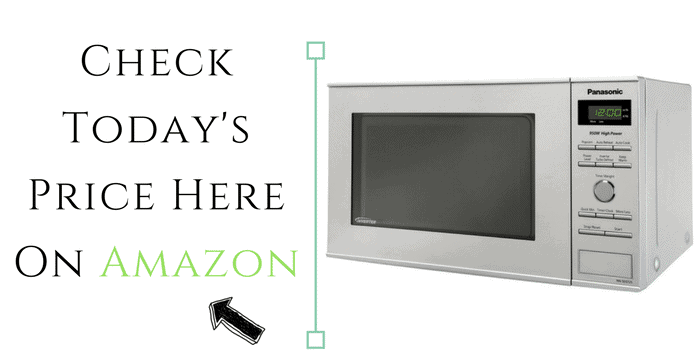 IF you want to have a quick meal, then this microwave is perfectly built for you. 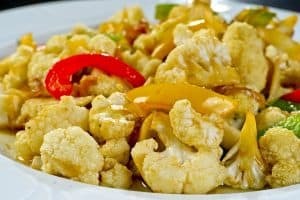 It tends to take all the hassle of guesswork to cook a variety of food, so you don’t have to worry about it. Starting from delivering immense power for quickly cooking the food to great inverter performance, it is a package of a great deal. So, hope this Panasonic NN-SD372S review has helped you know about the existence of this great model.